Celebrity Voice Impersonations and Celebrity Voices in Commercials. Celebrity Voice Impersonator and Celebrity Voice Impressions. Who does celebrity voice impersonations? We Do! If your looking a celebrity voice impersonator we may have the celebrity voice your looking for. MediaRocket delivers celebrity voice impressions for your voice over commercials. 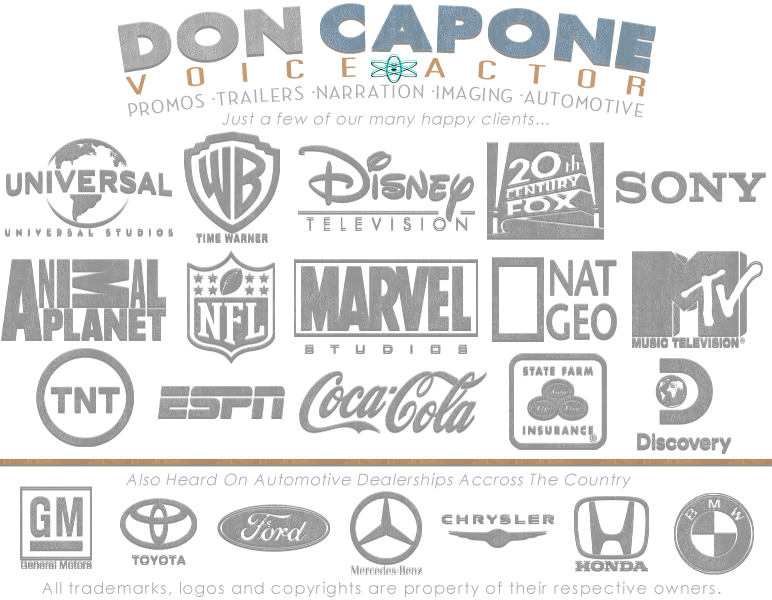 Some of the most requested celebrity voiceover impersonations are for voice actors like Jeff Bridges, Sam Elliott, Morgan Freeman, Tom Selleck, Tim Allen, Sean Connery, Jack Nicholson, Mike Rowe, James Stewart aka Jimmy Stewart, David Attenborough, Rod Serling, Denis Leary, Ray Romano, Marlon Brando as the Godfather Don Corleone and Transformers Optimus Prime and Megatron are just a few of the most requests voice over impressions. Contact us... We may be able to help! Disclaimer: Celebrity voices are sound alike impressions and are for parody and satire purposes only. User acknowledges that use of the celebrity voices beyond the pre-negotiated terms is unauthorized. User assumes full responsibility for subsequent utilization of the celebrity voices, and user further agrees to hold provider harmless from and potential damages associated with that use. We have done voice over jobs all over the world. Voice over work from satisfied clients in every form of media and market. Voice over recording studio and professional voice talent services. New York City, Los Angeles, Chicago, San Francisco, Dallas, Houston, Atlanta, Philadelphia, Washington DC, Boston, Detroit, Miami, Seattle, Puerto Rico, Phoenix, Minneapolis, San Diego, Tampa, Long Island, St. Louis, Denver, Baltimore, Pittsburgh, Charlotte, Sacramento, Cincinnati, Cleveland, Salt Lake City, San Antonio, Las Vegas, Orlando, Nashville, Memphis, Hartford, Seattle, Toronto, Montreal, Vancouver, London, Dublin, Ireland, America, United Kingdom, UK and Japan are just some of the places where our voice overs can be heard.